Our company Totally Latin America have been providing luxury vacations to the Galapagos for over a decade. In this time, we have learned of the very best providers and tour options available. In planning a luxury Galapagos cruise 2019 there are so many options to choose from and so I have decided to lend my expertise to guide you to the very best available. Why a Galapagos Luxury Cruise for 2019? The diversity of any trip to the Galapagos is the major attraction. In floral, faunal and geographical evolution the islands never cease to amaze and astound. Each island and their hinterlands have unique stories to tell with hidden secrets to be uncovered and explored. The Galapagos are a popular but well-regulated haven of mother natures very best and 2019 is a great opportunity to come, live see and witness a true natural wonder of the world with Totally Latin America. Your cruise is enhanced by the very best naturalist guides who offer their knowledge in an enthusiastic and caring manner in this most special of destination. For over a decade Totally Latin America have worked with the very best partners in the Galapagos luxury cruise market and so have exceptionally competitive rates available to our clients planning a luxury Galapagos cruise 2019. A journey to the Galapagos on a luxury cruise is a once in a lifetime voyage back to a bygone era where the natural beauty of the world still reigns supreme. The prime deciding factors in choosing the right Galapagos cruise for you are how much time, how much do you have to spend and what size of boat you wish for your experience? Let us examine three of the best available options. To begin with I suggest a Haugan Cruise perhaps aboard the Petrel. This petrel is not a bird, as most petrels in the Galapagos, but a luxurious 16 passenger cruise boat. You can choose a 4,5,6 or 8-day cruise, my preference is the 5 day. I think 5 days allows for a deep experience and yet is never routine. 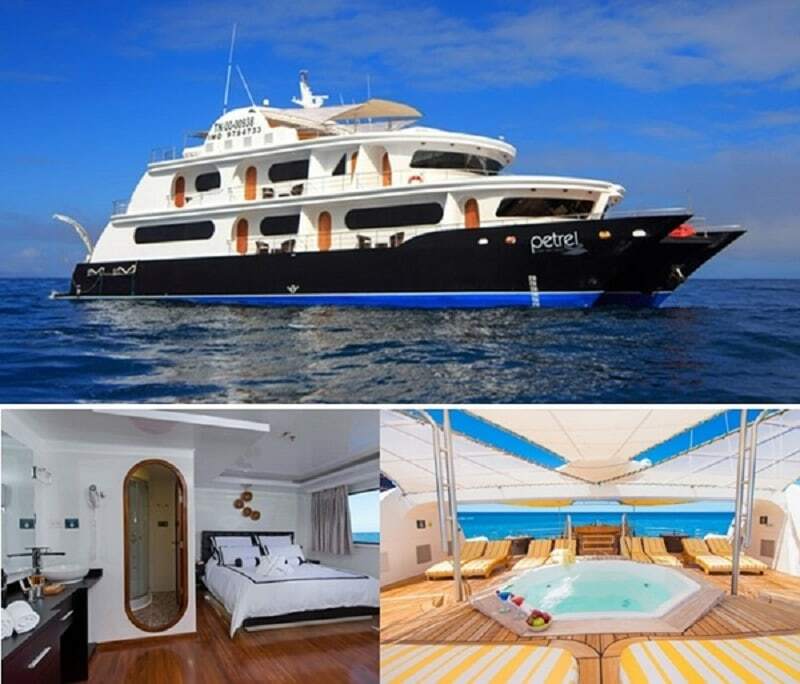 The Petrel offers spacious cabins, social areas and refinements such as jacuzzi baths. A Galapagos cruise is a meaningful experience and that is made possible by the finest of qualified and knowledgeable guides aboard this vessel. These guides bring the various islands to life with their deep knowledge and passion for the nature and habitats afforded by the individual islands. The small but very stable boat size offers an opportunity to become friends with both fellow guests and the guides. Without doubt this is best luxury Galapagos cruise 2019. 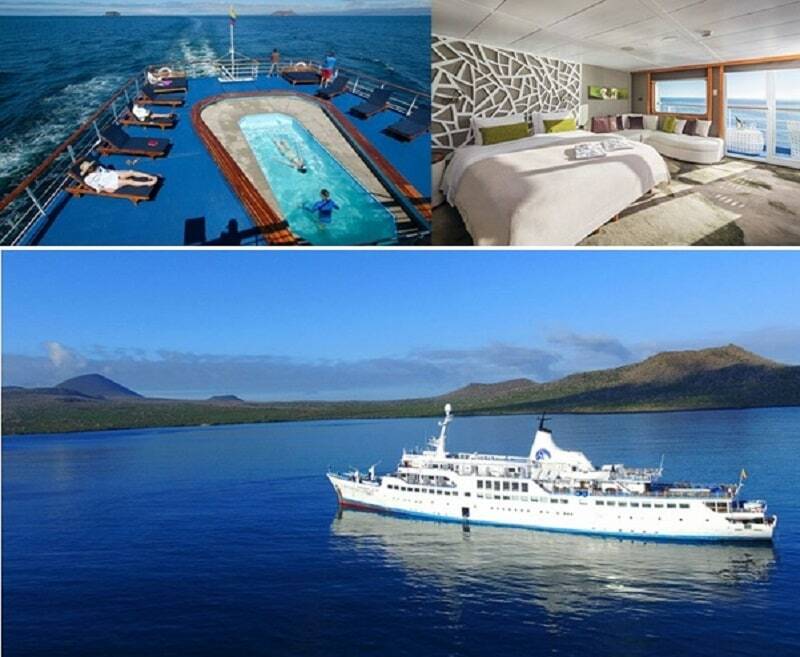 Another best luxury Galapagos cruise 2019 experience can be had aboard the larger Klein Tours Galapagos Legend. This vessel accommodates up to 100 passengers spanning three decks but you still get a meaningful experience as the guide to passenger ratio is allocated to about 1 – 10 or max 1 -16. There are 55 cabins in total matrimonial, double, triple or quadruple options, making this boat a particularly good option for families. The balcony and junior suites are especially well appointed, but also the less expensive standard plus cabins offer bright airy cabins to enhance your trip experience. My own favourite cabin for amenities and price is the junior suite with panoramic windows. The Galapagos Legend offers both 4 and 5-day East or West island cruises and I suggest the 5 day in either direction as a best Galapagos Cruise 2019. With the Legend you can mingle with a larger group of people and it has more of a feel that cruise lovers be at home with. To be able to enjoy a BBQ at night on a larger deck, mingle with fellow travellers and enjoy the bar too while reliving all the great memories of the day. The Klein cruise boats are an affordable option and a great introduction cruise to the Galapagos for many newcomers. 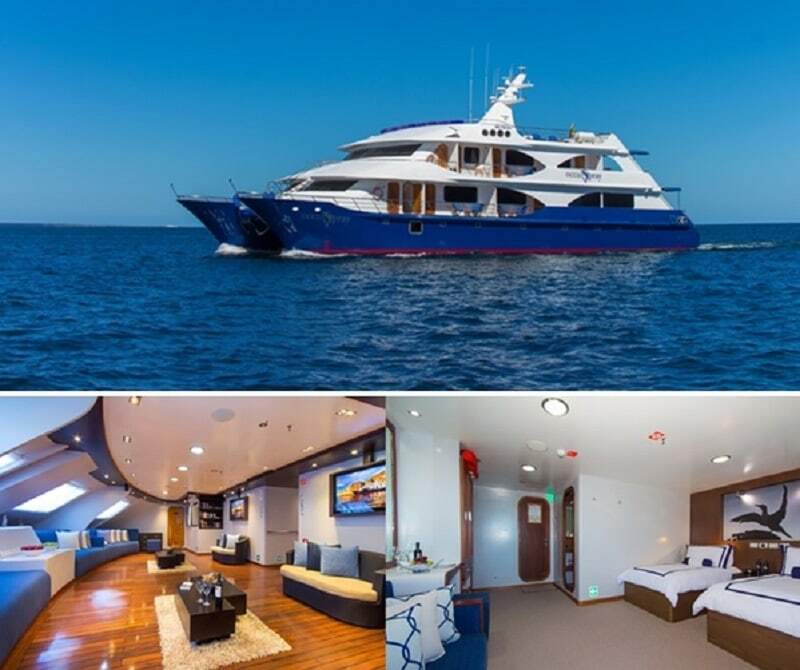 The 15 Day Haugan Cruise 2019 aboard the Ocean Spray is perfect for those that want the most comprehensive, and in that respect, the best luxury Galapagos cruise 2019. This 15-day trip covers all of the Galapagos archipelago. It includes Isabela, Fernandina, Española, Santa Cruz and Genovesa islands and is essentially the combination of two cruises so if you are not up to a 15-day cruise you can do 8-day options too. The Ocean Spray is a modern and luxurious 16 passenger vessel with features such as on-board jacuzzi and kayaks available too. The nine cabins are equally well-appointed offering individual private balconies. Smaller boats like the Ocean Spray are still stable in the water due to their catamaran design and yet offer the ability to access bays on the islands where larger boats are less nimble. If you have the time, then for a totally immersive journey in the wonders of mother earth this really is a very best Galapagos cruise 2019. Very many clients choose to add Peru to a Galapagos trip and so any of the options above would usually be combined with either some time in Ecuador or time in visiting Machu Picchu and Peru. A typical combined luxury tour of Peru with a 5-day Galapagos cruisewould require about 12 days in total. Your destination experts at Totally Latin Americaare always at hand to offer friendly independent, individually tailored advice to find your very own best Galapagos cruise for 2019. Prices, routes and a host of options are available with a Galapagos cruise to suit your needs. You are only one step away from the journey of a lifetime, make that step and contact us here.